The industrial themed furniture collection for Rabbit & Owl Deport was both inspired by the name of the ice cream parlor and the rustic looking interior design. 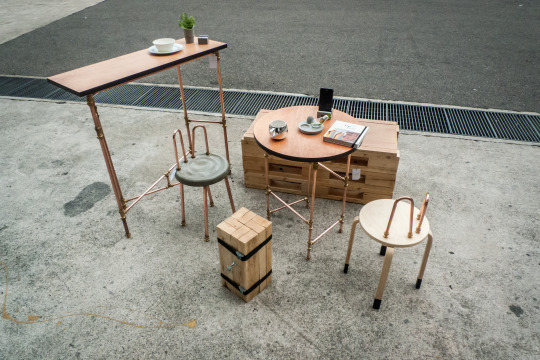 Using a combination of reclaimed wood and copper piping, Triple Eyelid aims to produce a collection of industrial inspired bespoked furniture that are exclusive, smart-casual and sustainable. The initial thought process was to use only reclaimed wood and cement for all of the loose furniture. However, the design turned out rather heavy, clumsy and too unfinished during the ideas conceptualisation. We subsequently introduced copper piping to make the design visually and physically lighter, and a great finished juxtaposition to the unfinished wooden style. A balanced combination of raw wood and reflective copper pipes completes the design as a whole. Rabbit are hyper vegetarians which makes them lighter as compared to owl furniture. 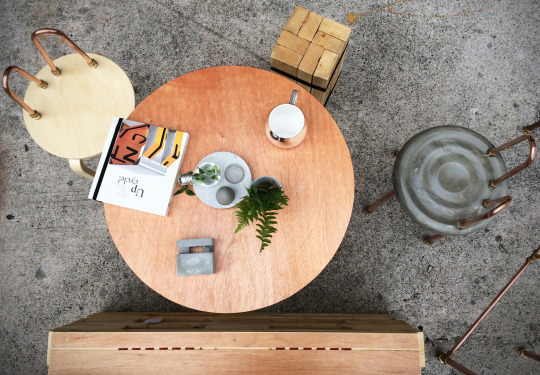 The plywood-copper table has a slimmer, lighter profile which allows them to be carried around. Rabbit ear handle allows easy handling of table as how a magician pulls a rabbit from the hat. Owls are calm carnivorous animal and stay still over long period of time. The reclaimed wooden benches and stools represents the owl furniture which are meant to stay still and not constantly being moved. The rawness and basic shape of the owl furniture represents a back to basics characteristics of a predator; simple yet practical. - The reclaimed wood used in this collection are treated wood used in architectural site. All furniture are sealed with low VOC epoxy sealer for additional protection against occasional spills, insects and fungus. - The copper piping table and chairs can be disassembled easily using a single screwdriver thus flat-packable. Flat packing furniture reduces the number of transportation required for delivery thus minimises the carbon footprint of each furniture. - Copper pipes are common building elements and can be sourced locally to replace any damaged parts without the need to import from overseas. Easily replaced parts extends furniture life and reduce the need to change a whole furniture in a long time.